Join our efforts by signing this online petition and let representatives know that the Coastal Conservation League's (CCL) bogus proposed alternative expressway is not a viable option. It is a laughable attempt to hinder progress that will negatively impact property owners in the Pee Dee region of South Carolina. Let your voice be heard. Protect your property and your rights. 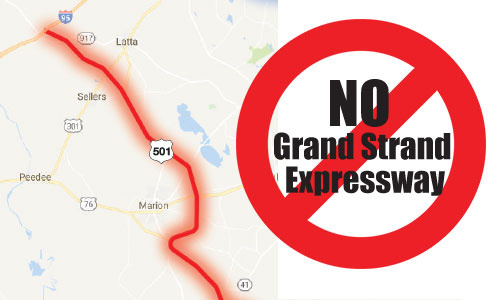 Say no to the Grand Strand Expressway. Why is the CCL pushing for the Grand Strand Expressway? The CCL filed a lawsuit in December to stop Interstate 73 from being built through South Carolina. I-73 is part of a national development project that dates back to 1978. In 1990 support for the project grew to include the Carolinas - ultimately leading to Myrtle Beach, South Carolina. The Army Corps of Engineers issued permits in January 2018 to begin construction on I73. Yet, thanks to another Coastal Conservation League lawsuit, the project is once again in jeopardy. In their latest lawsuit, they are not raising concerns of environmental protection. Those concerns were addressed and met over the last 10 years. This time they believe they have a better route. A route that will involve the construction of an expressway through the Pee Dee Region - possibly even through your property. The Department of Transportation defines an “expressway” as: A divided highway facility with partial control of access and two or more lanes for the exclusive use of through traffic in each direction; includes grade separations at most major intersections. Thereby, an expressway limits or eliminates your access to the road. An expressway will cost taxpayers hundreds of millions of dollars to condemn and buy properties in your community. The CCL wants your property to build this expressway to Myrtle Beach, despite the fact that the highly evolved plan to build I-73 has been in the works for decades. The CCL Board of Directors are not residents of the Pee Dee. Many members are not even full time residents of South Carolina. Yet they want to take your property and use it for their purpose. The South Carolina Department of Transportation has already purchased substantial amounts of land for I-73 (approximately 80%). To abandon the I-73 project at this juncture would be a financial mistake of epic proportions.